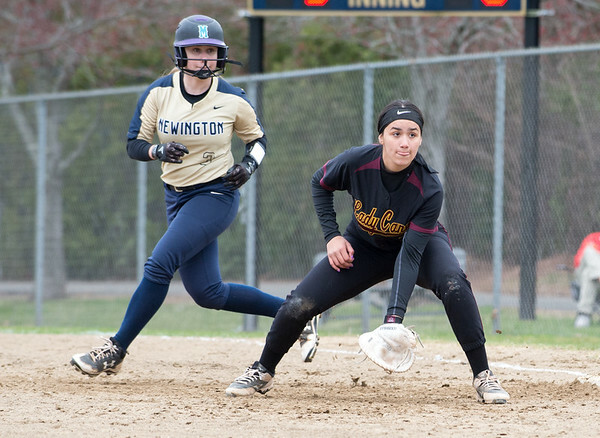 NEWINGTON - As the New Britain softball team went through warmups prior to its game against Newington on Wednesday, Richard Lorch provided his usual lively commentary from the Hurricanes’ bench. The content of his commentary, however, is anything but usual. “Look alive out there Picasso!” Lorch shouts to New Britain catcher Lianna Silva as a warmup pitch from Josleen Rivera skips by Silva to the backstop. “Come up throwing, Hollywood!” he calls out to left fielder Nataly Hernandez, who is shagging fly balls from head coach Joel Simmone. Behind every New Britain player lies a unique nickname personally hand-picked by Lorch. A member of the New Britain Board of Police Commissioners, Lorch has recorded stats for the Hurricanes and Simmone for three seasons after keeping the books for other New Britain teams dating back to the 1970s. Through all the different teams and players, there have been different nicknames. Since then, Lorch has been to New Britain, Plainville, and other schools in various coaching and stat-keeping duties, but the mark he leaves is one of playful positivity and creative name-calling, which the current Hurricanes roster has come love. Lorch leaves no Hurricane unnamed. Shortstop Xandra Silva is nicknamed “Shorty” due to her freshman stature, while first baseman Val Hernandez’s nickname is drawn from a similar inspiration, but for opposite reasons. Her towering height earned her the name “Geoffrey,” based on the Toys “R” Us giraffe. But as Lorch reveals, he wasn’t the source of Geoffrey. For a man who has been dishing out names for decades, he won’t become attached to the name if the player isn’t, which is what happened with Hernandez. So Geoffrey stuck, as Lorch went with the change effortlessly while maintaining cornerstone nicknames like “Pa Pa” for senior Paola Martinez, or “Mak Attack” for second baseman Makaila Masterson. Lorch calls out the nicknames during game action, and is always received by smiles and laughs from the Hurricanes, who welcome the playful atmosphere. It also doesn’t hurt that Lorch keeps a mean box score. The Hurricanes on the field feel the same way, even those down in JV who can hear the comical nicknames being shouted out at the varsity roster. They want a piece of the action, but Lorch has to draw a line somewhere, before he runs out of ideas. “I got girls at JV asking for a nickname, but I said you have to be on varsity to get a nickname.” Lorch said. JV players might have to hold out for another year or two, but once they arrive, they will have their own nickname waiting, one different from the countless ones that preceded them. Posted in New Britain Herald, New Britain on Friday, 12 April 2019 20:31. Updated: Friday, 12 April 2019 20:33.